Here is a quick financial scenario for an employee who gets paid twice a month. 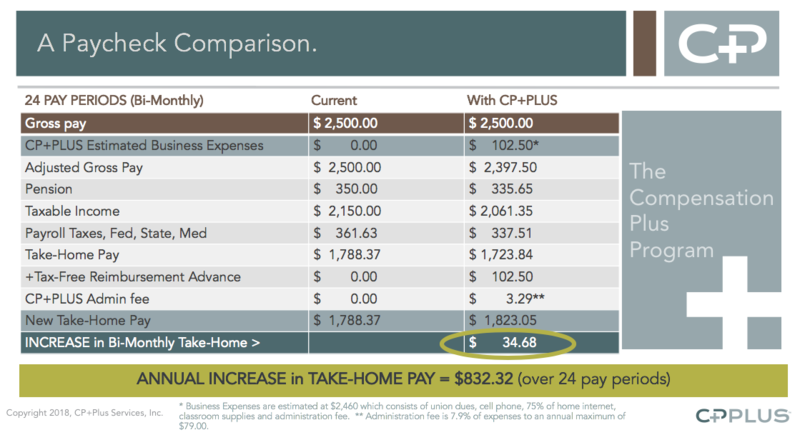 With 24 pay periods annually you can see the difference made with the columns showing with and without the CP+PLUS program. Let's imagine this is a teacher who has union dues, uses home internet to access grading, email and homework tracking — and uses their personal cell phone to communicate with parents. But the list does not stop there. Throughout the year they pick up classroom decorations, certificates and awards at the teacher store for special occasions, take photos of student projects and have them developed, and buy candy snacks for students to help keep them motivated. With CP+PLUS they can literally snap a photo of any of those receipts while they are still in the store and submit them to their account. Over the course of the year, that teacher will pocket over $800 that would have otherwise not been in their take-home pay. Wow.